Provide your guests with the best! 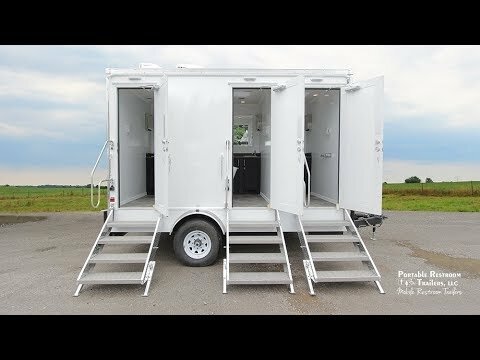 The 2 Station Calypso Series Portable Restroom Trailer offers a durable and upscale environment perfect for any event, casual or formal. This 12.5-foot portable restroom trailer is completely self-contained, with a 100-gallon onboard fresh water tank and 370-gallon waste tank. A clean, fresh exterior greets each guest with heavy duty fold-up aluminum steps and rails for easy access. The women’s suite includes single white ceramic china flushing toilet, single vanity with sink and metered faucet, and a large shatter-proof vanity mirror. The men’s suite features the same amenities and also includes a urinal. Your guests are sure to enjoy the comfort of a fully climate-controlled environment maintained by air conditioning and heat strips, as well as a 3 Season package for cooler temperatures. 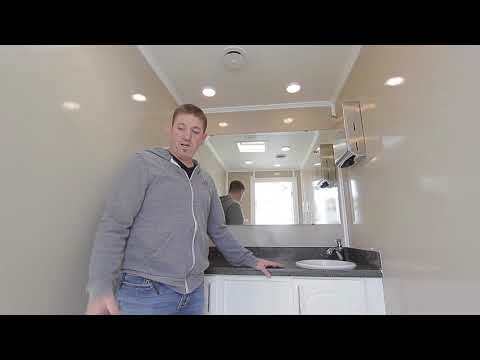 This trailer is also upgraded to include a water heater so your guests can enjoy a hot water hand wash.